Pitmaster is the definitive guide to becoming a barbecue aficionado and top-shelf cook, whether you’re new to the grill or a seasoned vet. Recipes begin with basics, like cooking Memphis-style ribs, and expand to smoking whole hogs North Carolina style. This definitive collection of barbecue expertise will leave you in no doubt why expert chefs and backyard cooks alike eat, live, and breathe barbecue. You will learn tips and techniques for proper smoker operation and successful backyard barbecues, and explore recipes for side dishes, cocktails, desserts, and barbecue from all regional styles. 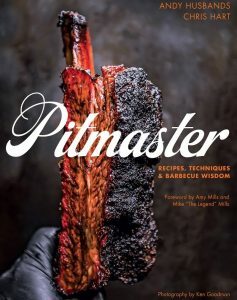 Featuring chapters by guest pitmasters, among them Steven Raichlen and many more, you’ll hear from the experts on their given region and style of barbecue.